Looking for a different way to celebrate Halloween this year? Using the fairy tales from the brothers Grimm may just be that something different that makes your Halloween party unique. The brothers Grimm wrote many stories, so here are some of their most popular ones to get the ideas flowing. Cinderella, the girl with the glass shoe, could be the theme of the party. She is one of the most popular Disney princesses. Save time with decorating for this party by using a themed kit. When guests enter the party, have them enter a magical world by passing through the famous carriage that Cinderella rode in to go to the ball. Have something to do for the guests by setting up a princess piñata! Here is a video of one of the songs from Disney’s Cinderella. Guests could dress up as the mice, the evil stepsisters, the evil stepmother, the prince, or Cinderella herself! Snow White is another brothers Grimm fairy tale remade by Disney. For a Snow White party, have the girls dress up in Snow White gowns. For the boys, have them dress up as the Prince. Even have some of the guests dress in a hooded robe like the Queen did when poisoning Snow White with an apple. Set the scene with the Queen’s castle in the background of the party. To get in the spirit of this remarkable fairy tale, here is a song from Disney’s Snow White and the Seven Dwarves. Try our formula for a Halloween dance that Dr. Frankenstein could appreciate: music, food and atmosphere, with a little structured fun. We like to set up one or more large Halloween decorations that will be seen as soon as the guests arrive and will be a focal point all evening. Consider starting with a standee. The Haunted Manson Standee, for example, at 10’ tall and 9’8” wide, will fill even a gymnasium wall but will stand only about 1’ deep. Silhouettes and Halloween backgrounds meant for hanging will take up even less floor space. Tape down a cobblestone patterned flat paper in front of the large decoration and throw a few tissue grass mats randomly on top. Spooky trees, tombstones or other three-dimensional decorations will round out the display. If you have the room, you could hardly go wrong with the 8’X8’ Spooky Balloon Tree, shown at right, placed in the center of the room. Put radiant LED lights for balloons in some of the silver balloons attached to the tree, and some in loose balloons that you scatter about the room. Fill a Halloween refreshment table with interesting finger food (insert Halloween ladyfingers joke here). Make easy, fun appetizers and drinks such as pumpkin-shaped cheese balls, dubious dips and brew-ha-ha punch by selecting from a collection of 15 recipes at Southern Living.com. 1. Stir together ¼ cup melted butter, ½ teaspoon coarsely ground pepper, and ½ teaspoon kosher salt. 2. Cut 5 (9-inch) wheat wraps with a 3-inch bone-shaped cutter (or cut bone shapes freehand). Place them on baking sheets and brush them with the butter mixture. 3. Bake the crackers at 350° for 8-10 minutes until crispy. Cool them on wire racks about 15 minutes. Music doesn’t have to be all Halloween or horror-related, but do remind yourself what’s out there. Especially if you are creating your own mix for the party, we recommend starting your research with the 101 Best Halloween Songs site before heading to your subscription service. Since it’s a dance, the primary activities will be about music and, well, dancing. However, most guests of any age appreciate a group game or other activity as an ice breaker. Did you know that the song “Monster Mash” turned 50 years old this year? Recruit a couple of friends to lead a group line dance to celebrate. The dance has been choreographed many ways including Zumba versions, so be sure everyone’s practicing to the same video. You can turn it into a contest if you like, or just concentrate on drawing as many participants as you can. We have several photo op stand-ins in Halloween activities that you can personalize, and you can hold a Monster Vogue contest in which costumed guests can demonstrate their most frightening – and, hopefully, their most hilarious – fashion model poses. These activities call for designated photographers or perhaps a supply of single use cameras for everyone. With Halloween just around the corner, local Fort Wayne celebrities are offering their tips for spooky Halloween fun. We caught up with some on-air personalities to get their take on the holiday. Aside from handing out the candy, his favorite part of Halloween is carving pumpkins with his kids. Charly’s known as a master pumpkin carver around the Butcher house. The secret to his pumpkins is using templates and lots of patience. If you love carving pumpkins too, check out these tips for protecting your jack o’lantern from mold and dehydration. Down the hall in the K105 studio, morning host Dude Walker‘s favorite part of Halloween is “scaring the crap out of people at the station.” He enjoys playing “fun natured” pranks, like waiting for people to come into their offices and jumping out to scare them or wearing masks. You can create your ultimate Halloween party like Charly, Dude, and Jim using ShindigZ Halloween decorations and kits. Create an old mansion setting using one of our Haunted House Kits or the crypt silhouette. Accent the yard in front of your house with personalized tombstones with funny or creepy names on them. Our zombie standees add an extra-spooky touch that’s perfectly on trend. Finish the look off with a smoke machine to create billowing Halloween fog. On the inside of the party, set your tables with creepy Halloween tableware. And add our creepy cuts in a selection of eyeballs, limbs, or fingers to the buffet table for a gross-out factor like at Dude’s Fear Factor party. Creating creepy food that isn’t quite as wild as Fear Factor can be a fun activity for adults or kids. You can make white chocolate eyeballs with pretzels and M-n-M’s as the pupil. A brain mold and pink Jell-O mix makes for a creepy edible focal point on your dessert table. 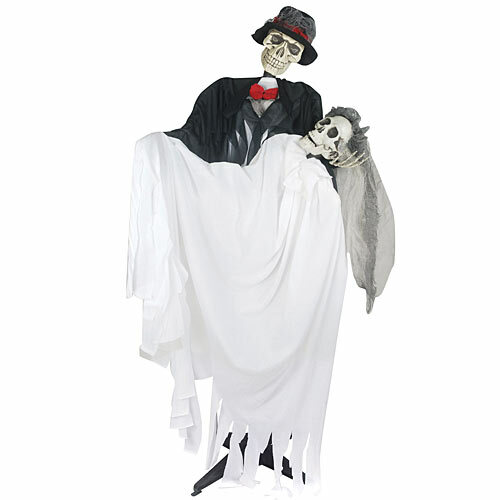 Set up wall decor or standees of creepy characters or add some cob webs around the room to add to the haunted mansion feel. Add strobe lights to your party space to create an unnerving ambiance. Remember, like Charly suggests, set the strobes along the wall so they light decorations at an angle and create an effect of seeing spooky sights out of the corner of your eye. Don’t forget Halloween costumes for your family! If cool costumes are a must-have for your guests, you’ll want to have an awesome alter-ego as well. Halloween is just three-weeks away and Ft. Wayne is decked out in autumn leaves and spooky decor. What are your favorite Halloween traditions or party decorating ideas? Sound off in the comments! Halloween is not just for the kids, it is also for the kids at heart, and this year can prove to be even more pleasingly ghastly with an adult themed Halloween party. Vampires are timeless and signature figures that have haunted the myths of Halloween for ages. Your guests will go batty for this year’s Villainous Vampire themed party when they step into your dreadfully transformed lair displaying the freighting sights of vampire scenes. But don’t turn your back; they just might bite into the fun. Let your friends pick up the pieces to the clues with a Murder Mystery Party. Turn your home into a terrifying crime scene and spend the evening figuring out which one of your friends has done it. But once you find the smooth criminal, be sure to give him the life sentence. Hickory dickory dock, the mouse ran up the clock, your clock struck one, and your party began, hickory dickory dock… only this year, with your Nursery Rhythms Party, your fairytale rhythms will become antagonist nightmares. Let your guests show their creative storybook-side when they turn America’s pastime favorites into fearsome foes. Little Miss Muffet just might frighten the spider away! There’s not much more that is able to invoke fear than the threat of doomsday, and this year you can give your friends a reason to collapse with your Zombie Apocalypse themed party. They’ll wish that night never… ended! Your guests will shiver when they walk down the isle of death at your Deadly Wedding Party. Turn your funeral home into a gruesome night of I-do’s, unless of course, they don’ t make it to their wedding night. Either way, the wedding couple will be in for a night to remember! However you decide to host an adult themed Halloween part, don’t forget to ask your guests to come dressed in their themed Halloween costume. This year’s party is sure to cause a scream!